I recommend this book by T.L. Frazier for all my brothers and sisters who love the Truth and hunger to know the Truth about the LAST DAYS and THE SECOND COMING OF CHRIST. This book will require you to think deeply and search the Scriptures and to put your preconcieved ideas about END TIMES on the altar of TRUTH. The back cover of this 325 page book reads, "We know that the Lord will come again, and we eagerly await Him", T.L. 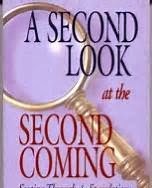 Frazier, in A Second Look at the Second Coming, has provided a balanced, well-researched treatment of the end-times, interpreted from the Christian East, by faithful Orthodox saints, martyrs, and Spirit-filled Fathers of the Faith."